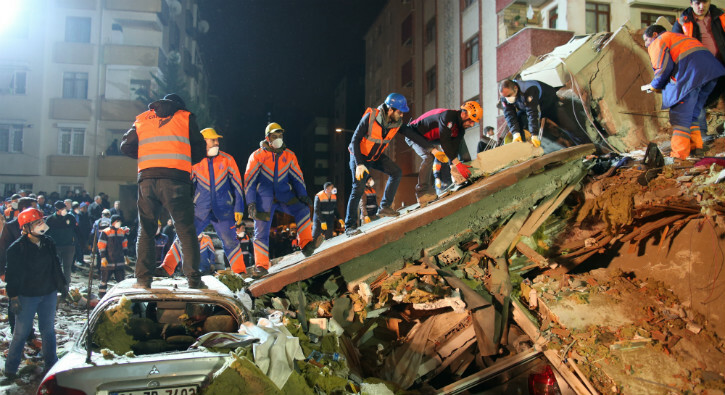 An 8 storey building collapsed in Istanbul on Wednesday, killed at least three and wounded many others. Rescue workers succeed to pull out many injured ones so far and have been working to save the others who were trapped under the debris. It was not immediately clear how many people were stuck in the rubble. Authorities say that most of the people living inside were not in the building due to the collapse took place in working hours. There were 14 apartments with 43 people had lived in the building which had a ground level floor and seven higher floors, Istanbul Governor Ali Yerlikaya said. “Top three floors were illegal,” he added. The building in Istanbul’s Kartal district slumped down approximately at 4 p.m local time, but what caused to disaster is still unknown. “Rescuers had made contact with four others still inside the wreckage. Racing against time, the teams are working, making great sacrifices,” said Binali Yildirim, ruling government’s Istanbul mayoral candidate and current parliament speaker, while he was visiting the crash site. More than 400 rescue workers have been trying to retrieve the people stranded under the collapse building. Yildirim said neighbouring buildings had been evacuated in case they were also damaged. Istanbul governor Ali Yerlikaya added that three of the injured were in serious condition and currently being treated in the intensive care unit. Two of the three who had lost their lives were identified. Istanbul chief prosecutor’s office said it launched an investigation into the collapse of the 27-year-old building. Security camera footage aired on Turkish channels shows some school kids running away from the site as the building was falling down and a dust cloud covered around. A court order issued a broadcast ban following the incident.